While its star attraction is undoubtedly the famous Nitmiluk National Park (Katherine Gorge), Katherine and its surrounds include great fishing, hidden natural wonders and a rich indigenous and pioneering history. The region stretches from the Gulf of Carpentaria to the West Australian border. 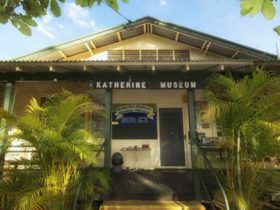 Around 300 kilometres south of Darwin, Katherine is set on the banks of the Katherine River. This unique outback town of around 8,000 people is the region’s major service centre. Katherine offers a wide range of accommodation, facilities and attractions, including museums, art galleries, character-filled pubs and historic sites. Other attractions within easy reach of the town include the Cutta Cutta Caves Nature Park, the Katherine Hot Springs and Leliyn / Edith Falls. Nitmiluk National Park (Katherine Gorge) covers an awesome 3,000 kilometres of magnificent escarpment country. Nitmiluk means ‘cicada place’ to the local Aboriginal people. The Katherine River flows through 13 separate gorges that carve their way through the Arnhem Plateau. You can canoe, cruise and swim between sheer cliffs to the sandy freshwater beaches of the main gorges, and view ancient Aboriginal rock paintings high on the rock faces. Waterfalls and rock pools are found along over 100 kilometres of walking tracks, beginning at the park’s visitor centre. An hour south-east of Katherine is Mataranka, where the famous Mataranka Thermal Pool is found. Travellers can enjoy a refreshing dip in the pools, which are surrounded by the rainforests of Elsey National Park. The small historic town of Pine Creek is also well worth a visit. The Katherine area is a local government area (LGA) in Northern Territory. This area is home to 12 locations and/or suburbs which you can explore in more detail by selecting from the list below. The Katherine area is located approximately kms from the capital Darwin.